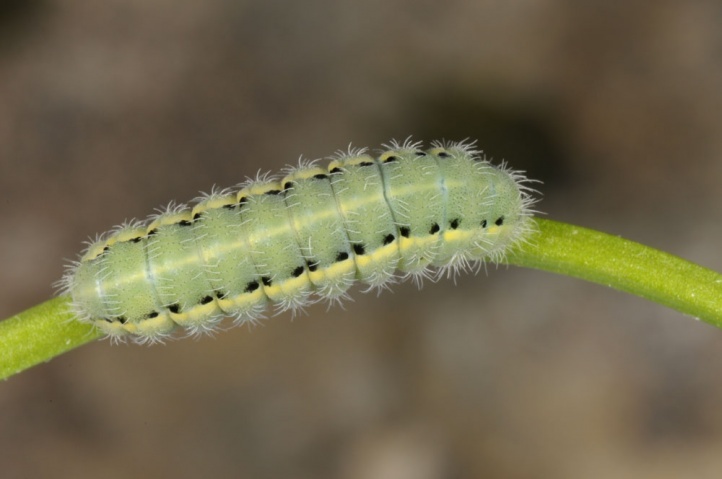 The caterpillar lives primarily on Lotus creticus. 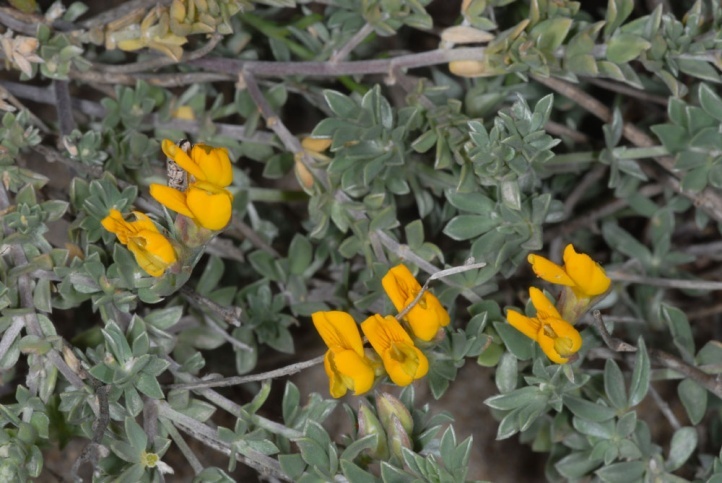 There are also records in literature from other lotus species, Astragalus and Onobrychis sp. 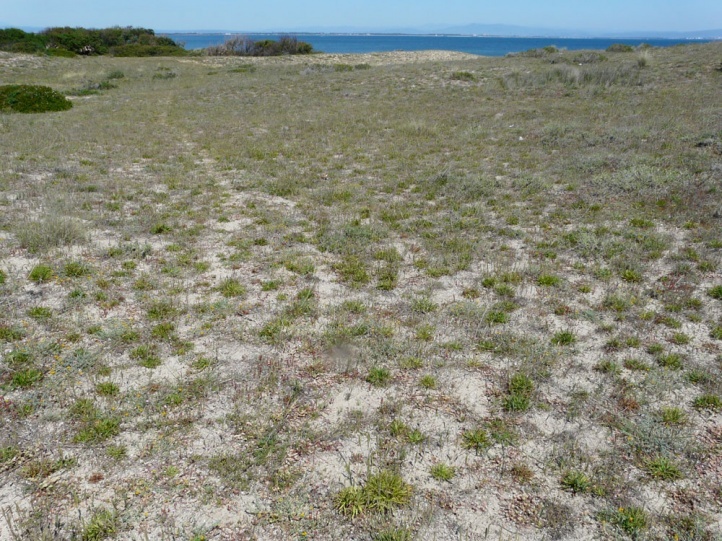 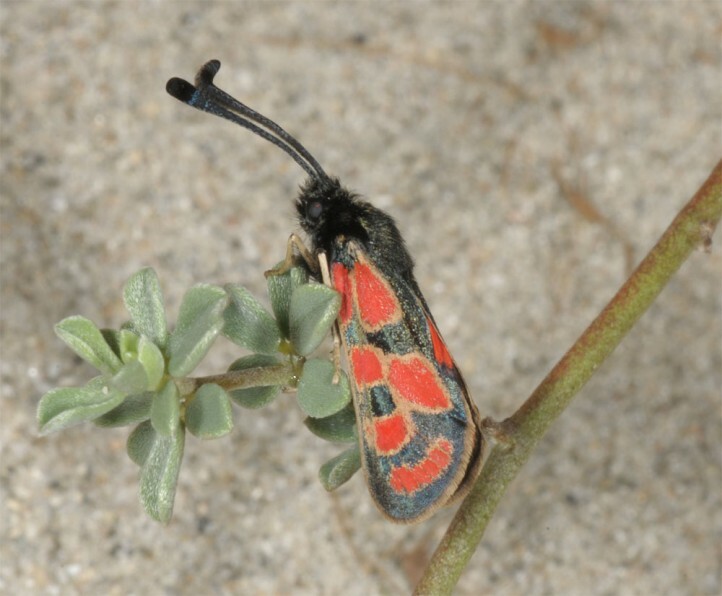 Zygaena orana mainly inhabits coastal dunes that are already richer in vegetation. 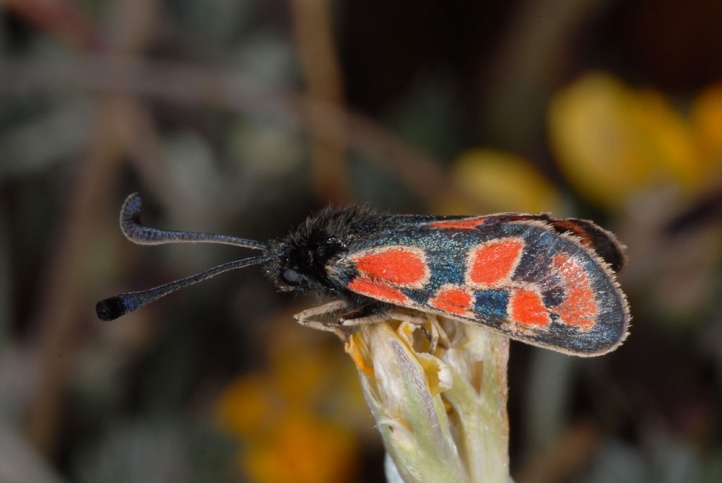 More rarely and only in north Africa Zygaena orana is also found in dry plains, on calcareous slopes and even in forest clearings (in Morocco up to 1600m above sea level). 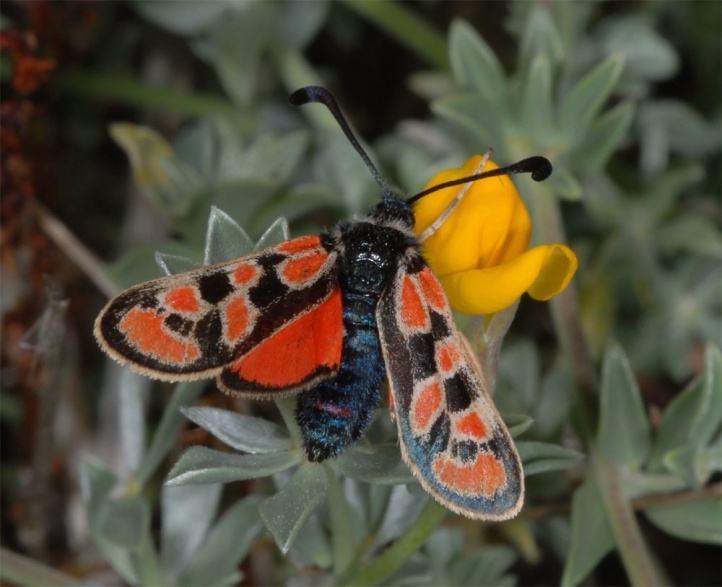 In Sardinia the moth occurs only near the coast. 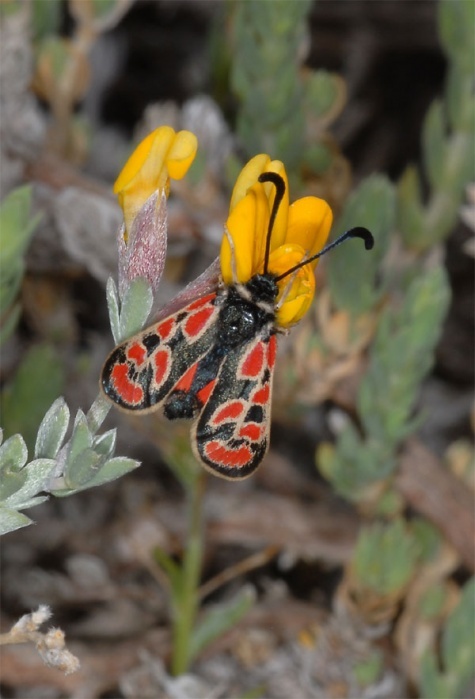 Typical accompanying species are in Sardinia for example Utetheisa pulchella or Brithys crini. 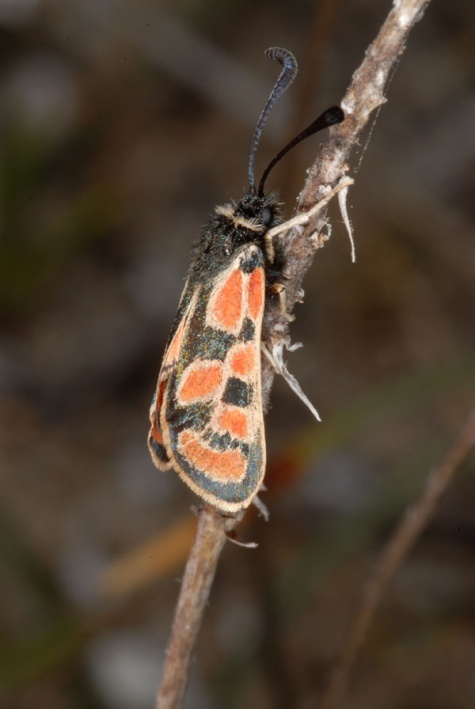 The moths fly in several (often three) generations from March to October/November. 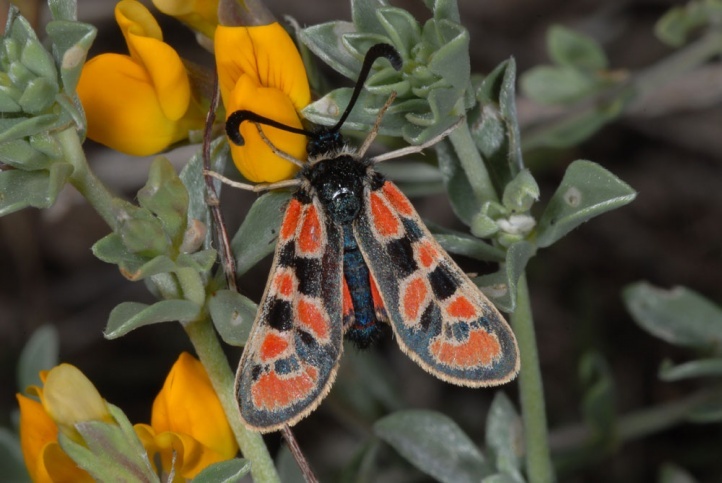 Yet a focus on a more abundant flight period from March to May is unmistakable. 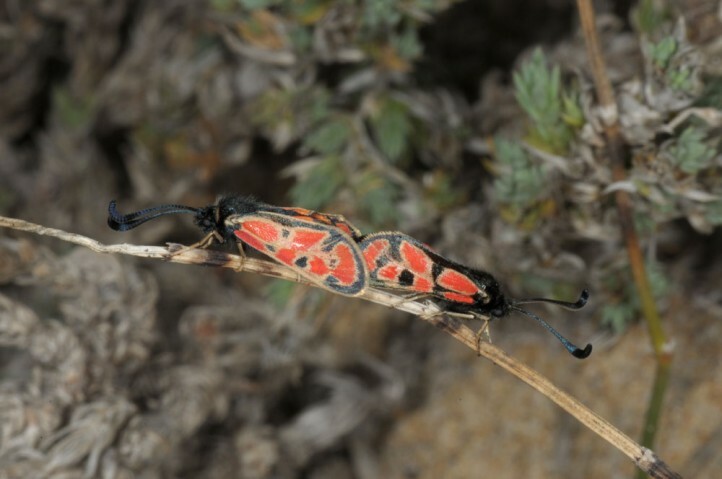 In mid-May 2012, I met in Sardinia only a few moths, the most worn. 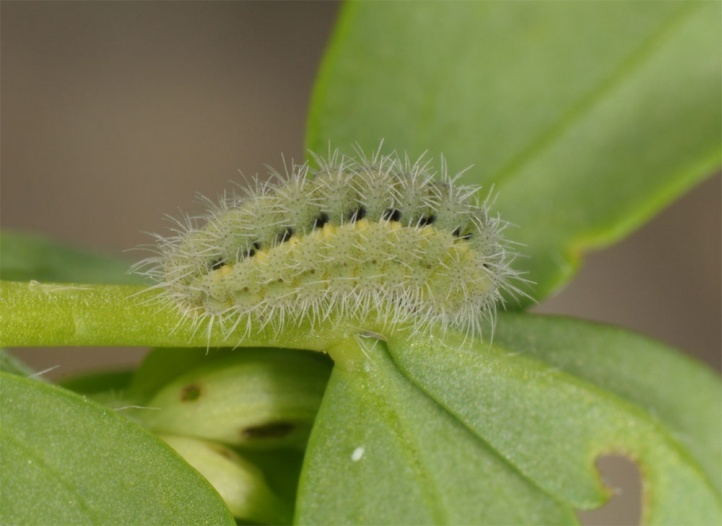 But very small caterpillars were very common on Lotus creticus (descendants of the March/April moths). 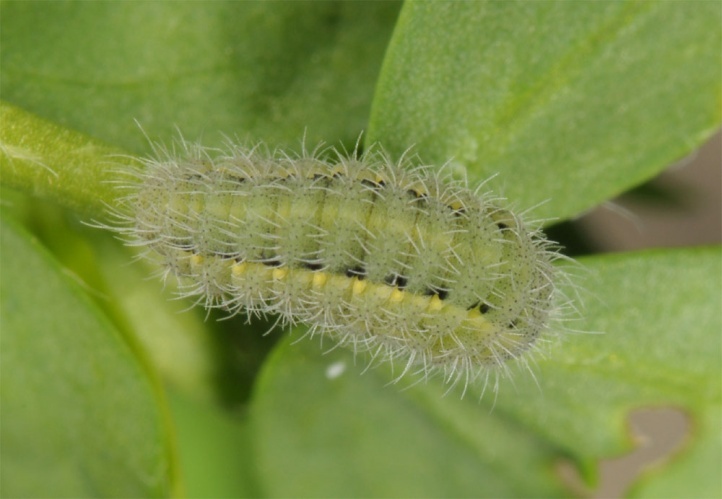 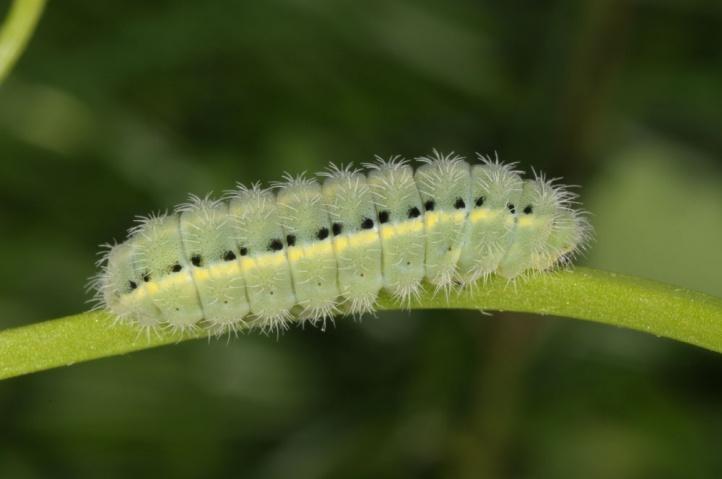 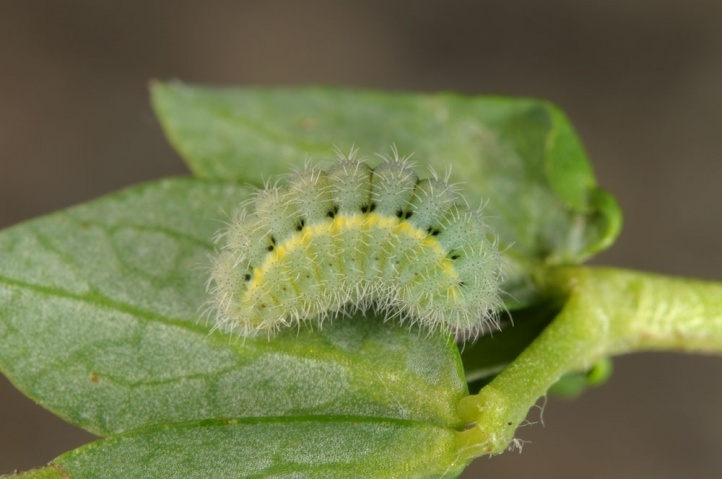 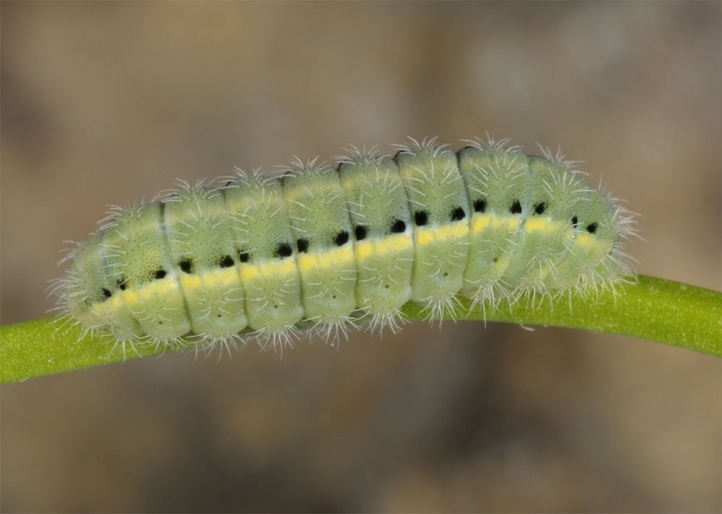 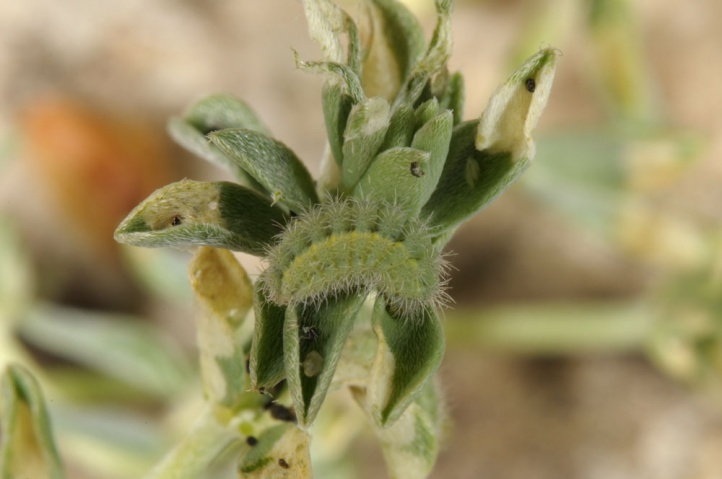 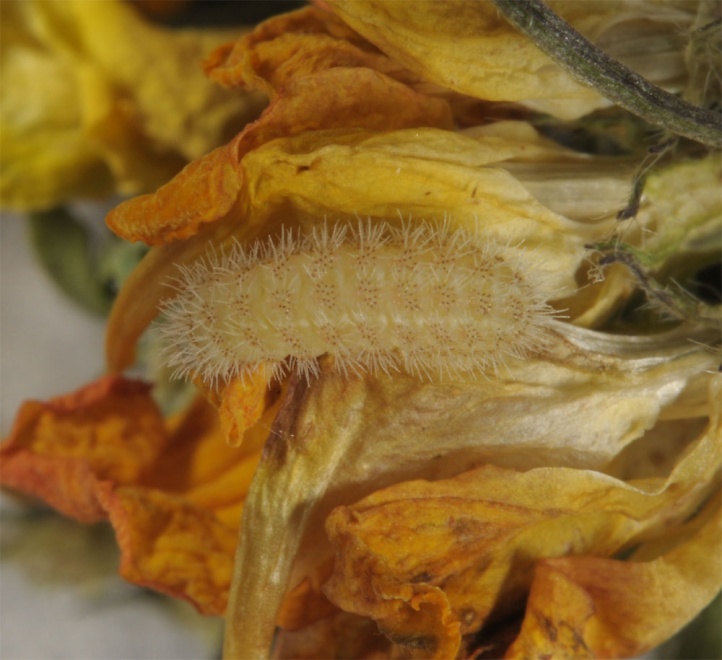 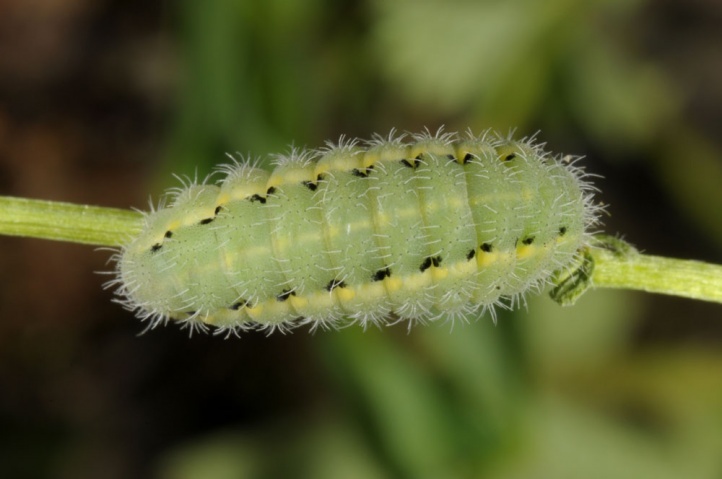 These caterpillars start dormancy due to the onset of summer heat/drought to a greater extent until the autumn, and then develop in the winter to give back the spring adults. 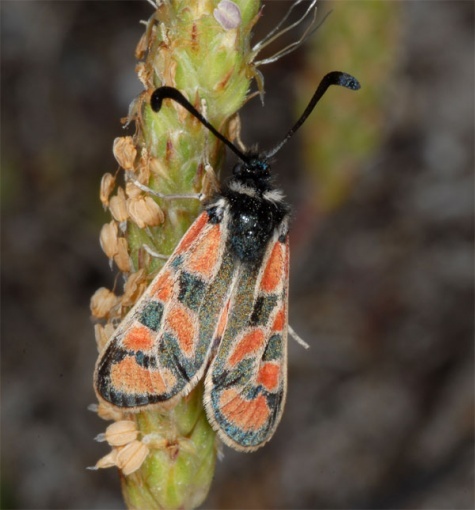 The other part is developing subitanous and results in moths in the same year. 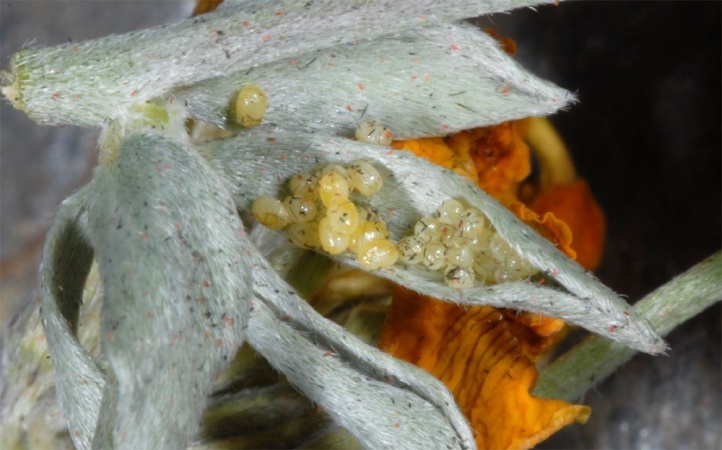 Their offspring then divides again accordingly. 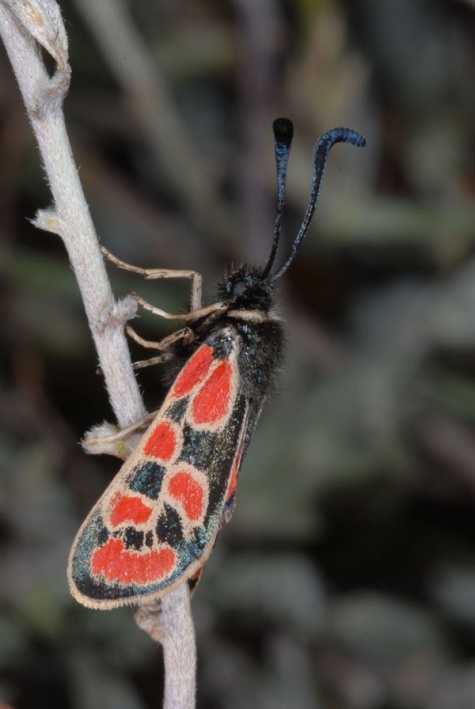 I recorded also many moths in late September and early October 2018 (Arborea, Sardinia). 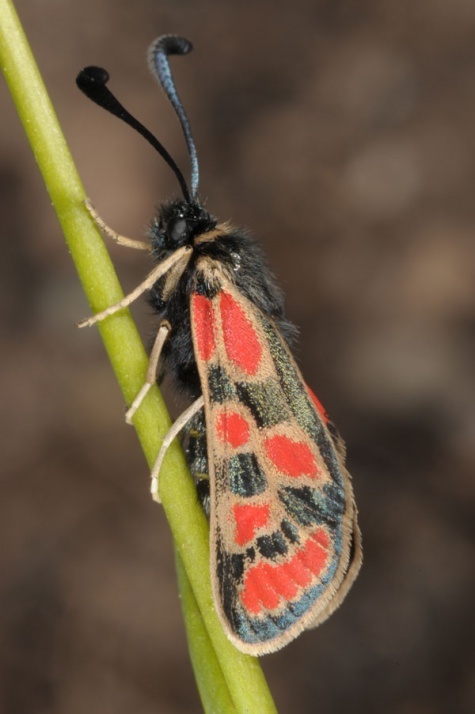 The moths fly around on the day vividly, even in strong winds. 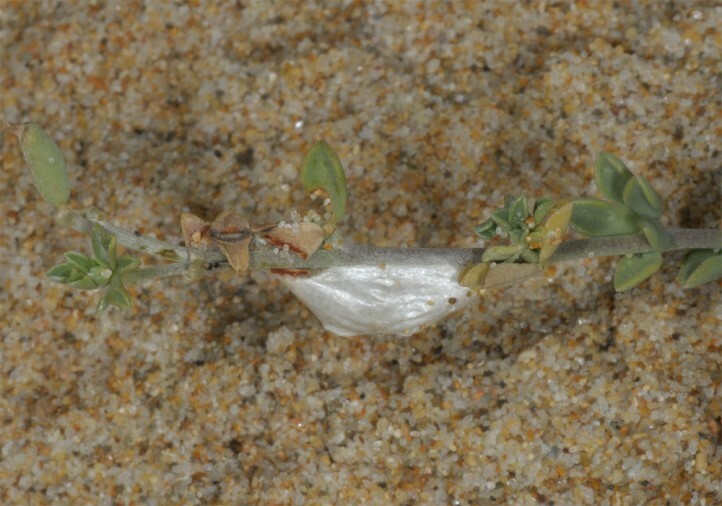 The males patrol persevering in larval habitat. 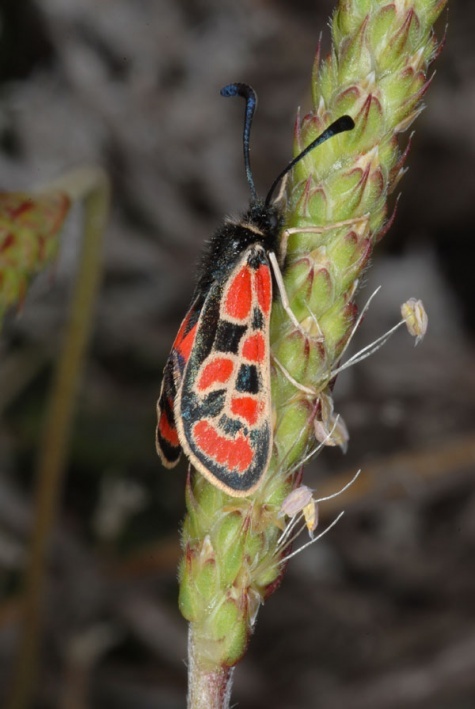 They visit eagerly flowers as usual with Zygaena, most often those of the larval host plant. 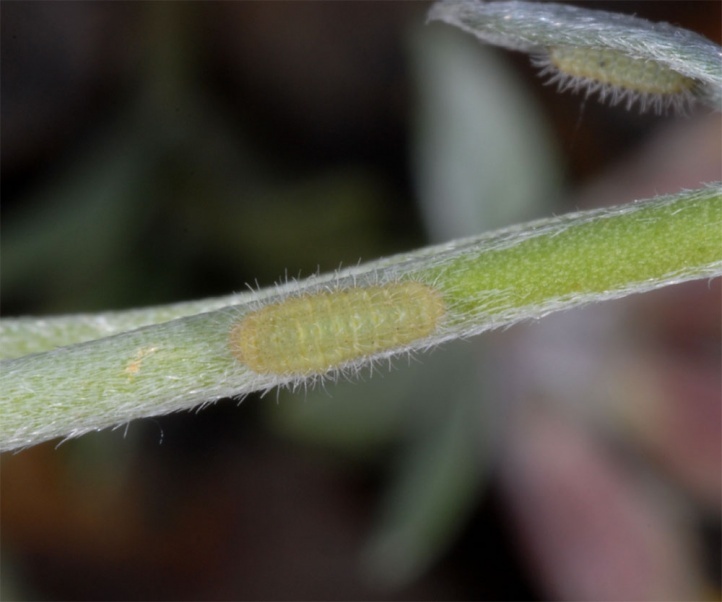 The young caterpillars produce a distinctive white mining feeding pattern. 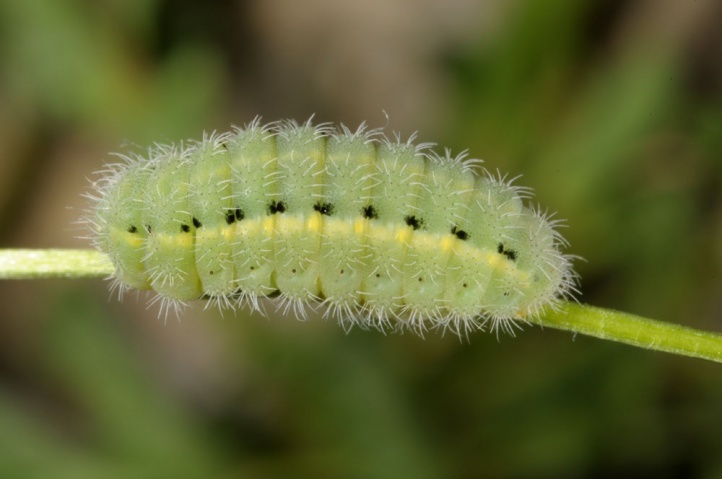 The mature caterpillars resemble something some forms of Zygaena carniolica (in which the triangular spots can be reduced to a point). 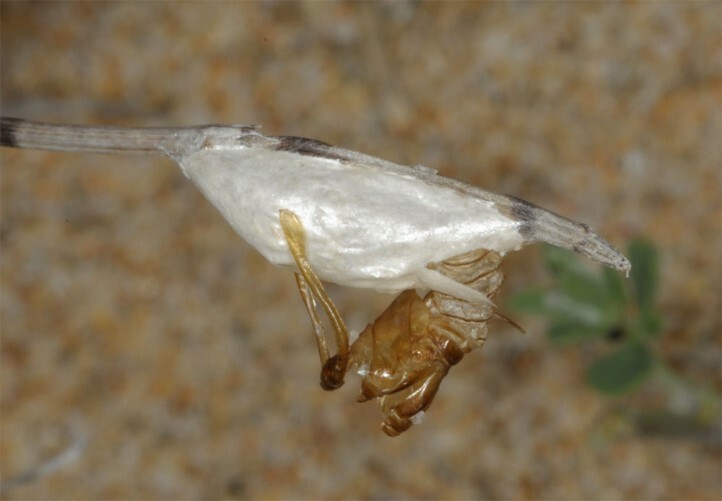 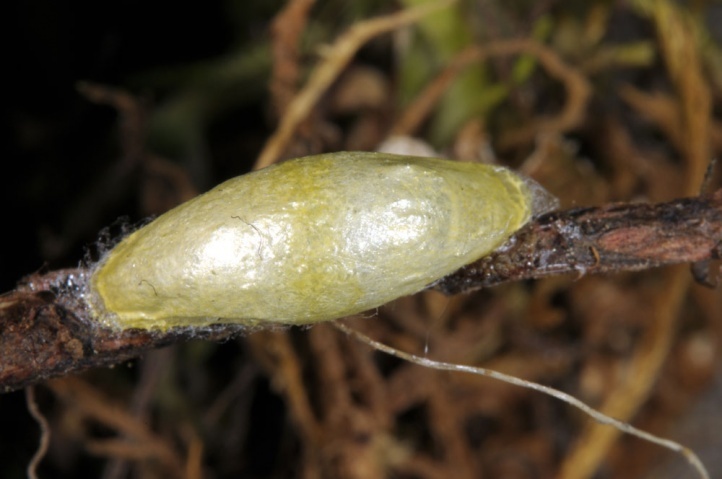 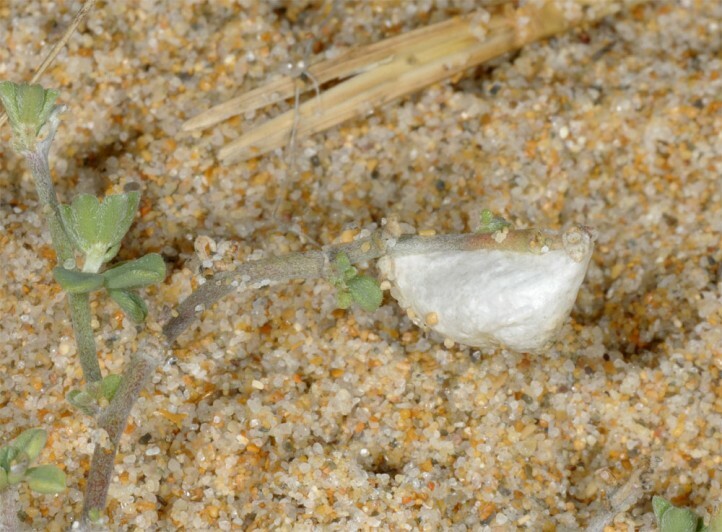 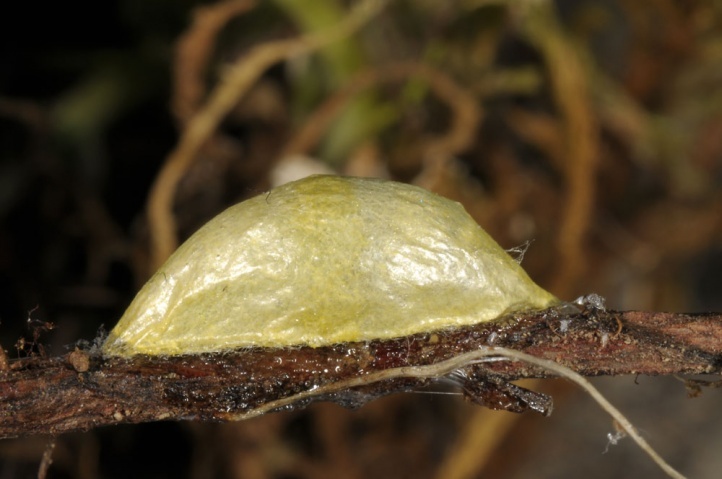 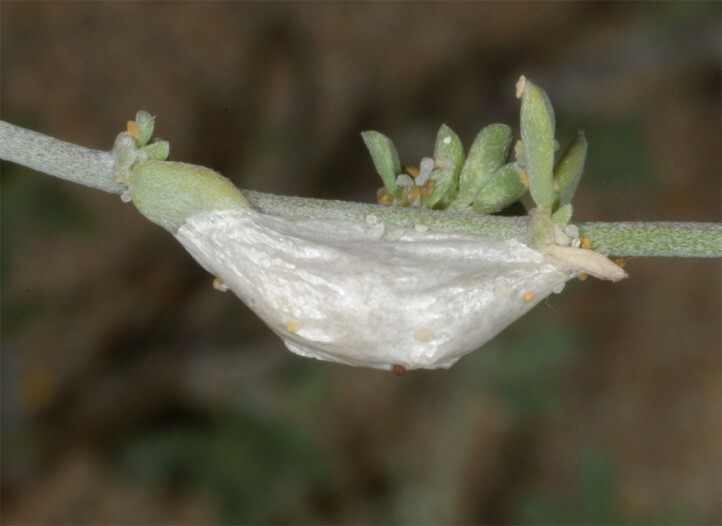 The yellow cocoon is constructed mostly well concealed in the ground vegetation. 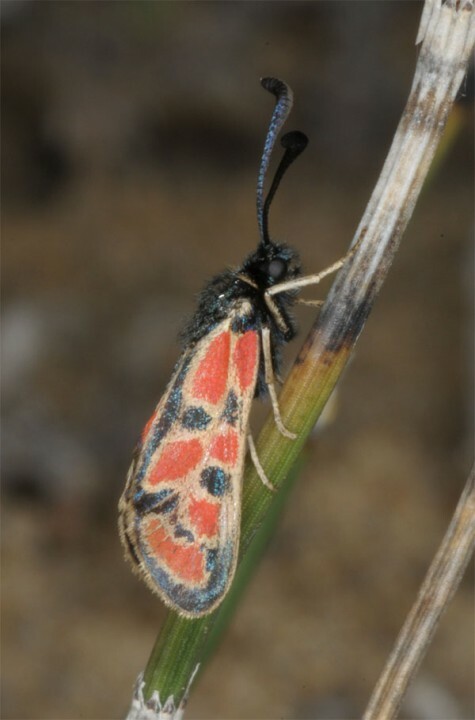 Zygaena orana is endangered in Sardinia. 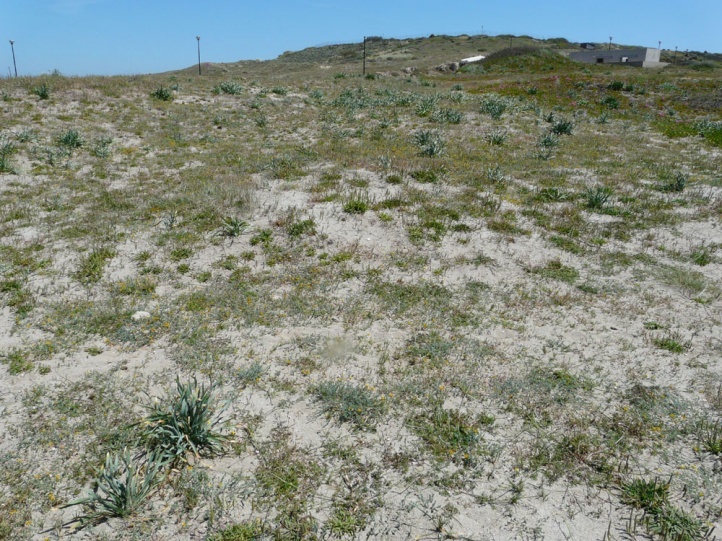 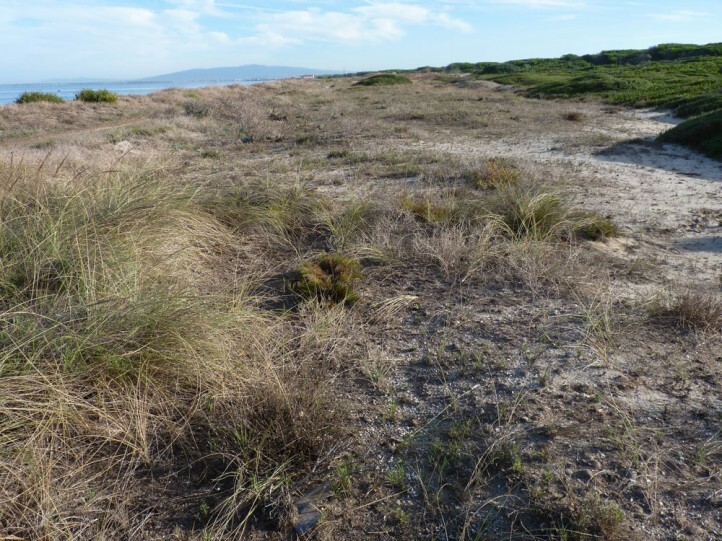 Large parts of the populated dunes are already affected by weekend homes and tourist facilities. 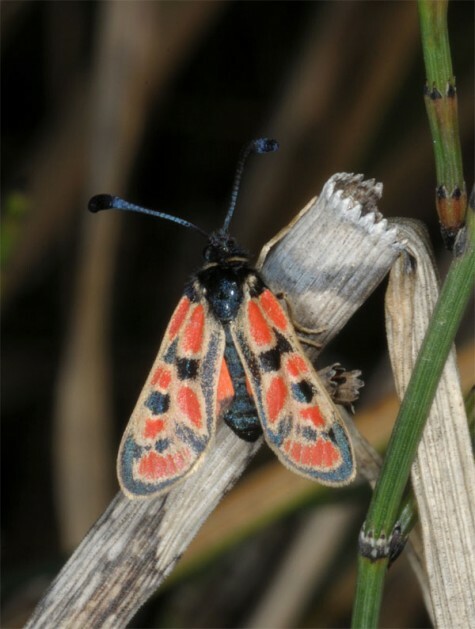 But the moth still occurs in greater abundances in the remaining habitats. 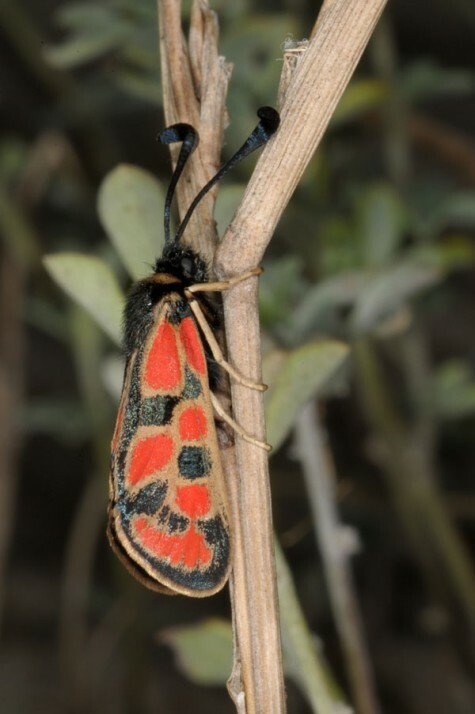 Zygaena orana inhabits Northwest Africa (Morocco, Tunisia, Algeria). 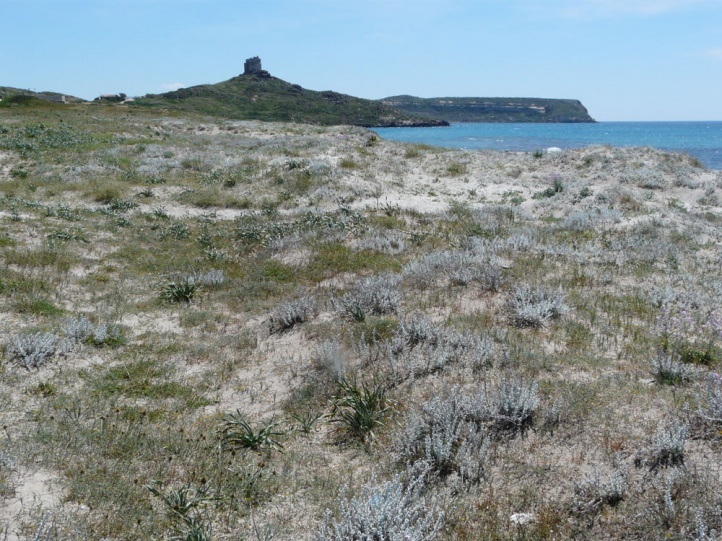 In addition, it is found in Europe on the southwestern coast of Sardinia. 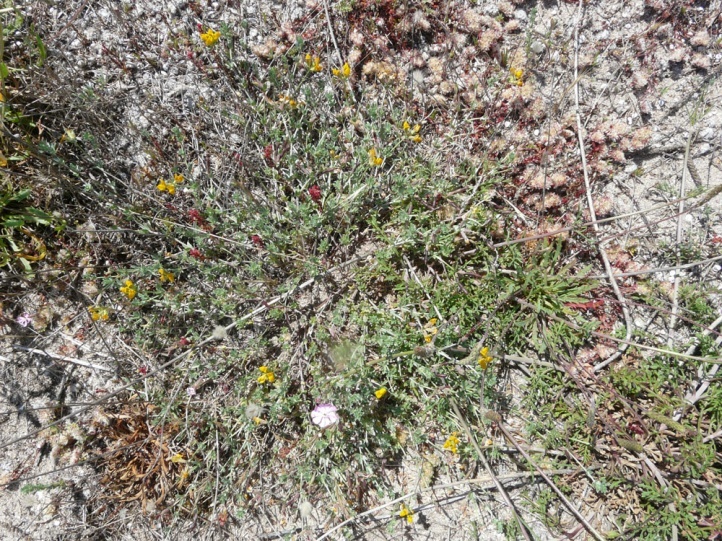 This occurrence may have been founded by introduction in antiquity (but not certain). 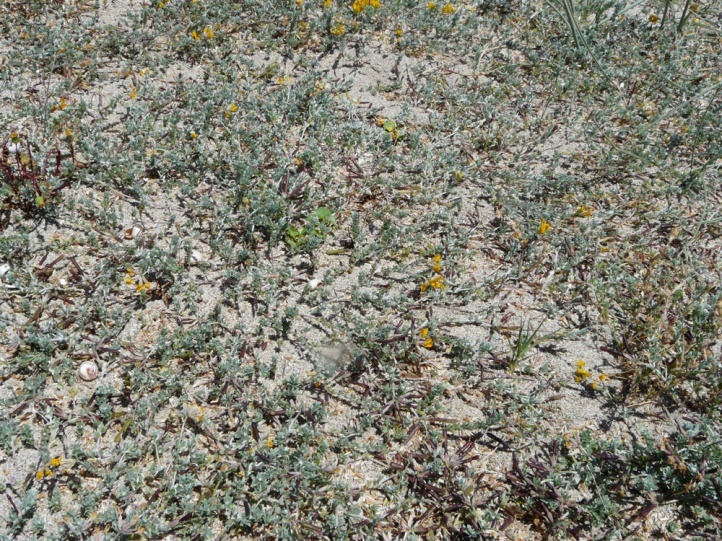 Also an active colonization seems to be possible, as with favourable winds.